The island of Mljet is situated in the southern part of the Adriatic Sea, just 30 kilometers southwest from the city of Dubrovnik. 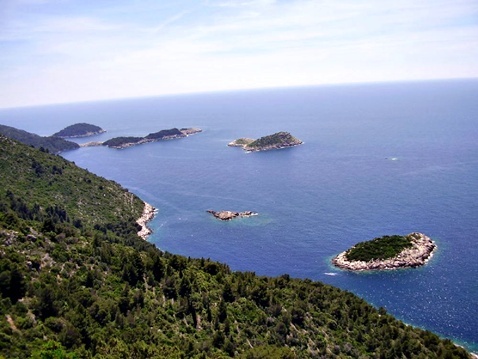 This gorgeous, unique green jewel located in the open sea near Peljesac (Pelješac) peninsula, separated from it by 8 kilometers wide Mljet channel, is surrounded by neighbouring islands of Lastovo and Korcula (Korčula) which are 18 kilometers away. Mljet, one of the greenest islands in the Croatian Adriatic, covered with a thick Mediterranean vegetation of alepian pines, is considered to be the largest island of the Dubrovnik archipelago. In 1960, one third of the island was proclaimed a national park. Special attention is drawn by the fact that the island of Mljet is one of the last residences of Mediterranean monk seal, legally protected animal species. Several legends are connected to the island of Mljet, among which are those of the Apostle Paul, who has shipwrecked on Mljet as well as those of Ulysses, who was captivated here by the nymph Calypso.